In which Victor Ibañez should draw Storm forever; Alti Firmansyah should draw everything forever; and somehow we have filmed 100 of these things! Fancy hats provided by Anna Sheffey. Read James Leask’s article on Dani Moonstar–and find links to more of his work–here! In which we get back on the continuity train; everything is the aftermath of Inferno forever; you should never fight a tractor or a horse without first putting on some damn pants; Vincent Price would’ve made a terrific Doctor Strange; Rusty Collins never really gets a fair break; Boom Boom is in over her head; and Brett Blevins takes his place as the definitive New Mutants artist. In which Deadpool V Gambit comes to a close; Extraordinary X-Men gets an annual; Laura Kinney cancels her pull box; and we are so over Civil War II. Rose City Comic Con Gallery! Art by David Wynne. No prints this week, but you can contact David to purchase the original! OH HEY WE FINALLY UPDATED THE ZINE COVERS, TOO! The second J&MXtX-M zine is precisely what it says on the tin. Miles and Al at our booth! Having the wall up at our booth meant we got a ton of rad photos at the con as well as the party. Here’s Administratrix Emeritus Tina as Emma Frost! A superlative ’90s Cyclops and Phoenix! Eric also cosplays a super excellent Quentin Quire. We do quick and very unprofessional sketches for $1 at conventions! Here’s Miles’s Dark Phoenix! Punk Storm, by Jay (who forgot to take pictures of most of their sketches, most of which were of Warlock). Adam X gets more X-Treme every time Miles draws him. Miles’s Mirage ain’t afraid of no Demon Bear! If you tell Jay to draw whoever they want, Jay will draw Warlock. Every time. Shadow is a super awesome local musician, and they came to the party as Wolverine with a viola, which may be the greatest deep-cut cosplay of all time. More fun with the photo wall at the party! We have reached Peak Jay. This is not a drill. It wouldn’t be a convention without Cyclops Has a Good Day sketches! Ramon Villalobos went full-on peak ’90s, and it is AWESOME. It’s a little off-theme; but, look, when you get a chance to ask Larry Stroman to draw Havok, YOU ASK LARRY STROMAN TO DRAW HAVOK. 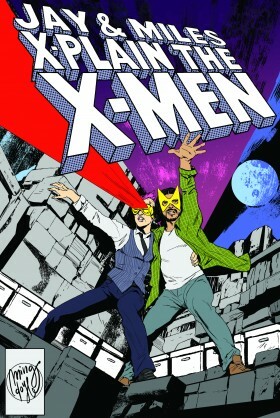 Jay and Al spent the weekend making X-Men minicomics! You can read all of them right over here! In which we return to Rose City Comic Con and somehow manage to one-up last year’s Stryfe cold open; Greg Pak has secretly written all of the X-books; Cullen Bunn may or may not be watching you RIGHT NOW; the X-Men distill down to murder and kissing; Toshiro Mifune should be everybody; Miles swears first (for once); and we can’t wait to see all of your X-Men roller derby names! NEXT WEEK: The New Mutants go to Asgard! There’s not exactly a visual companion to this episode, but you can find a Rose City Comic Con gallery on our blog! No prints for sale this time, but you can still contact David Wynne for the original of this week’s illustration! In which Psylocke gets her groove back; there’s more to plot than superhero fights; and sound effects become temporarily obsolete.